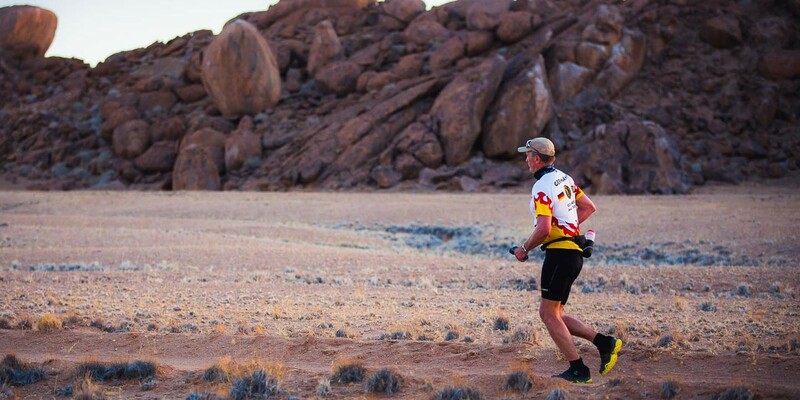 A race through the oldest desert in the world, 100 kilometres long: Friedhelm Weidemann has taken on the challenge. 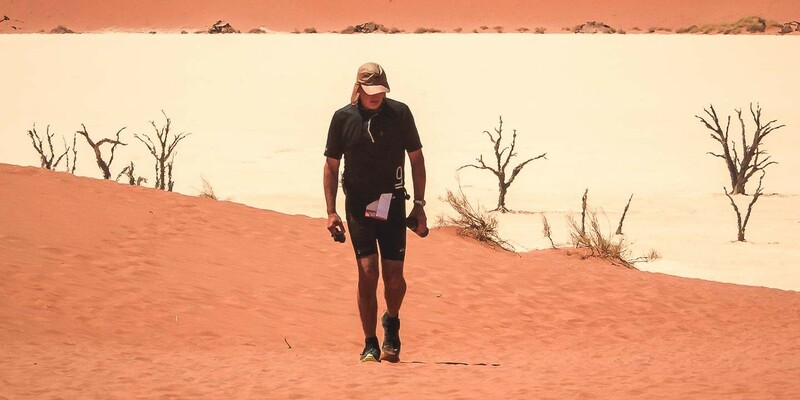 Through dried-out river beds and salt pans, over huge sand dunes without a hint of shade. 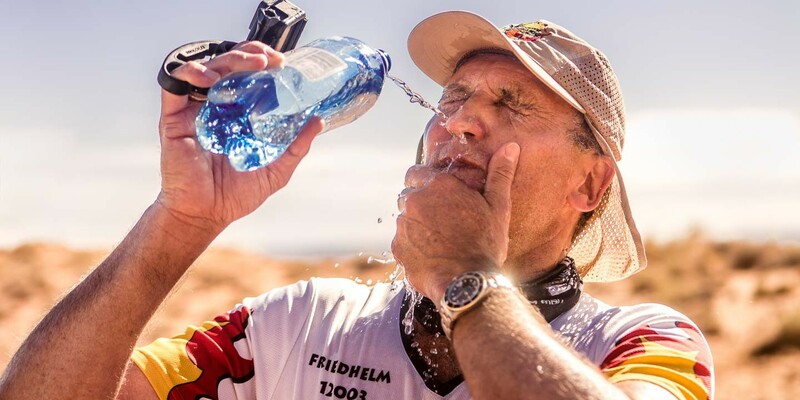 The different stages were about more than experien­cing the race for the 58-year-old – Friedhelm Weidemann also expe­rienced the effects of climate change first-hand. 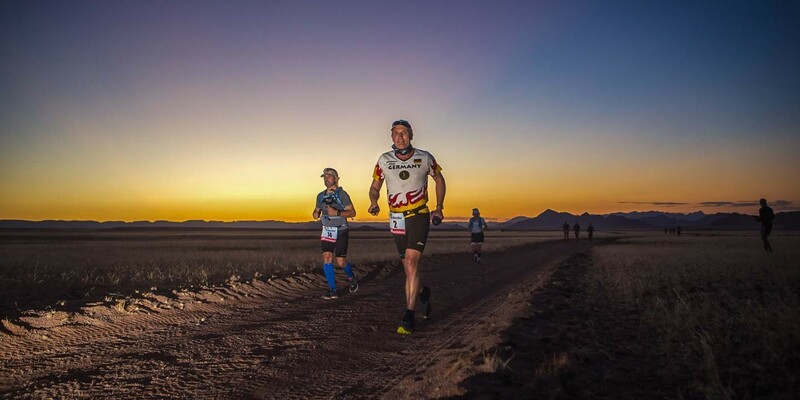 Together with 21 athletes from seven nations, Friedhelm Weidemann starts the 100-kilometre ultra run through the barren Namib Desert on the evening of 4 December 2017. 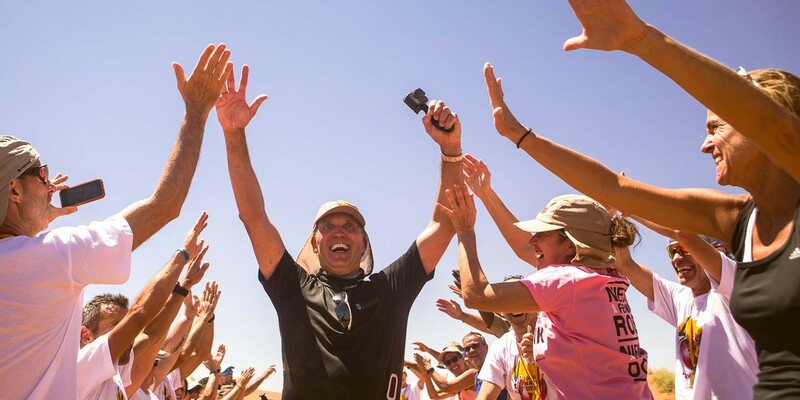 The second stage takes the runners through the dried-out Sesriem Canyon – a river bed that only sees water every five to seven years. 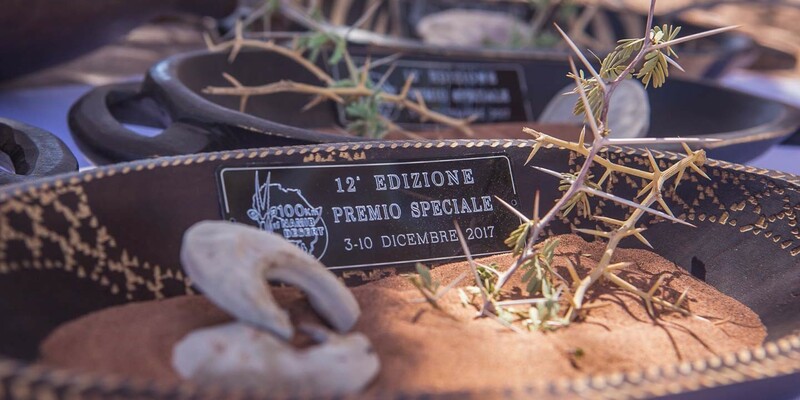 Every kilometre makes Weidemann more aware of the effects of climate change: the desert is expanding; the few trees dry out due to the lack of rain. 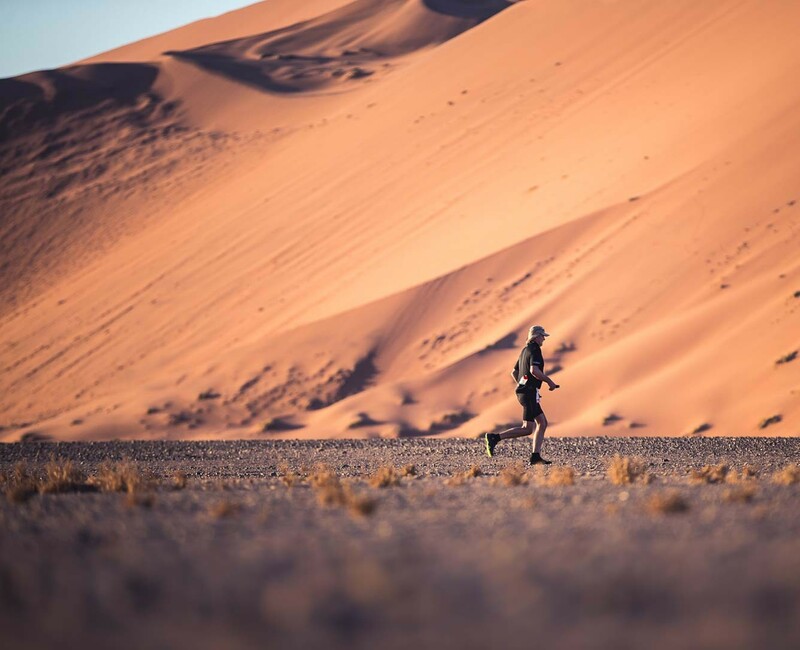 The toughest stage is the marathon through the Namib Desert. 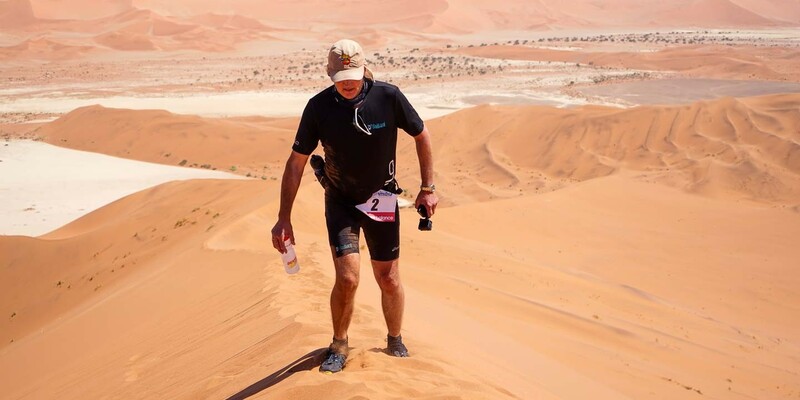 42 kilometres, temperatures reaching 56 degrees, no shade – Friedhelm Weidemann is pushed to his limits. Weidemann is slow to climb Dune 45 with its hot, thick desert sand. 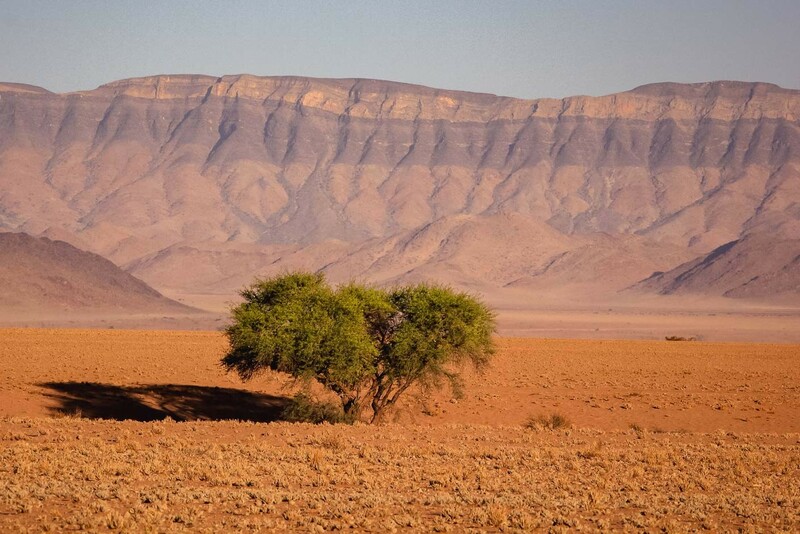 Standing a good 170 metres tall, it is one of the Namib’s most spectacular dunes. 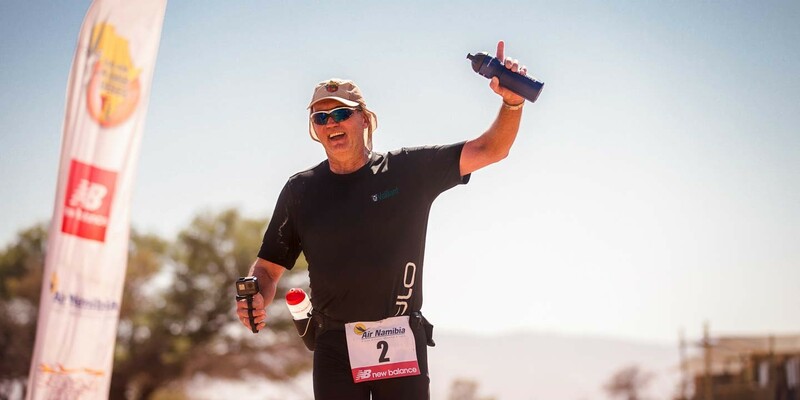 ... Friedhelm Weidemann is overjoyed to cross the finish line on 7 December. 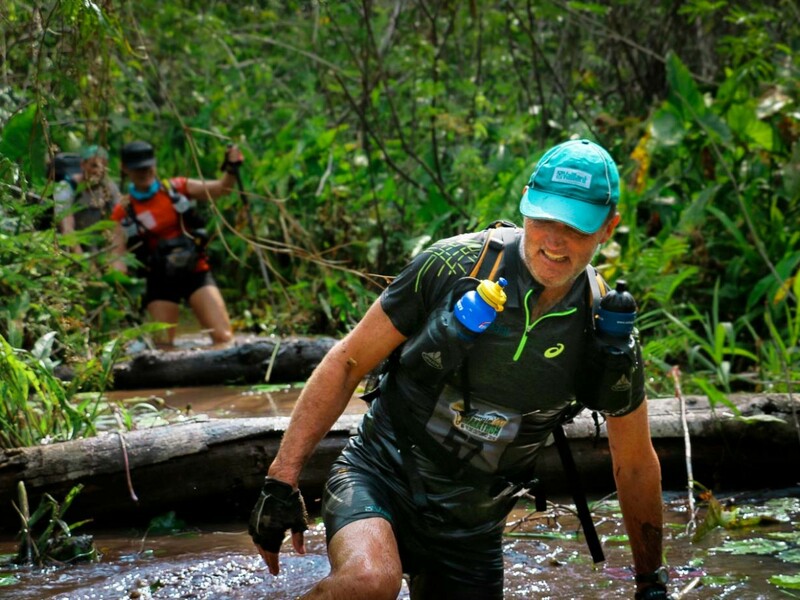 He has mastered the energy-sapping stages with passion and determination. 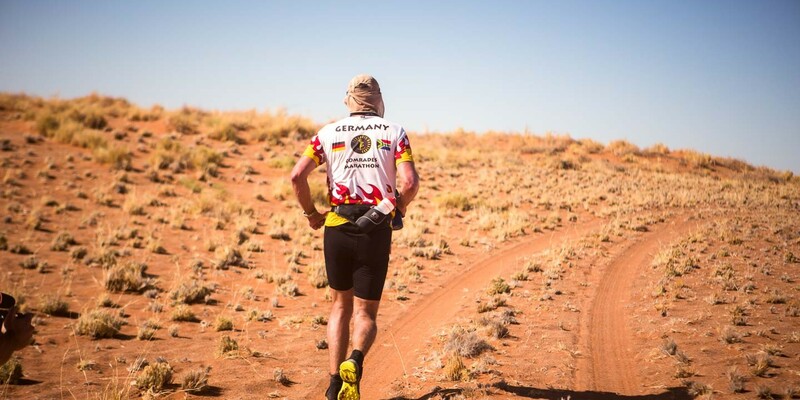 Weidemann is awarded a special prize as he has run the most marathons of everyone taking part. The 58-year-old has completed 301 runs. The prize is a gift from the desert: sand, bones and thorny branches. More frequent droughts are causing bush encroach­ment in these areas. The desert could spread out further – with devastating conse­quences, i.e. dwindling agricul­tural land and the risk of bio­diversity being lost. The desert is spreading and it is important to do something about it. The people who live here need the land. 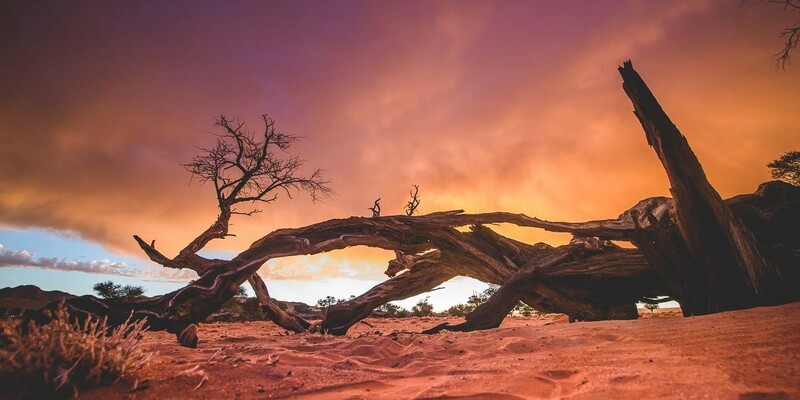 Namibia is the driest country south of the Sahara. 83 per cent of precipitation evaporates immediately, 14 per cent is absorbed into the ground, 2 per cent is held by dams – and just 1 per cent trickles into the groundwater. Climate change is causing extreme weather phenomena, with floods and droughts becoming ever more common. With junkyard scraps, solar energy, creativity and enthusiasm, Pio Barone Lumaga and his students from the University of Namibia are working on a low-emissions future for Africa. In 2016, 15 students at the Namibia University of Science and Technology (NUST) developed the first prototype of an African solar-powered taxi. The inter­disciplinary team comprises mechanical, electrical, electronic students from the Faculty of Engineering, and students from Windhoek Vocational Training Center. Rene Mukasa – a 28-year-old from Katima Mulilo, a small town in north-eastern Namibia – joined in 2017. She studied electrical engineering and, in her role as project manager, keeps everything running smoothly. She works alongside with Pio Barone Lumaga, Director of the Innovation Design Laboratory (IDL), an Italian who was one of Italy's first environ­mental engineers. Back in the 1990s, he developed cars for leading European automotive manu­facturers. In 2015, he founded at NUST, IDL to establish a center for cross-disciplinary research looking for solutions to Namibia's wicked problems. "The students call the first prototype of their solar-powered taxi “Frankenstein” – because they built it from different parts salvaged from a car scrap-yard. 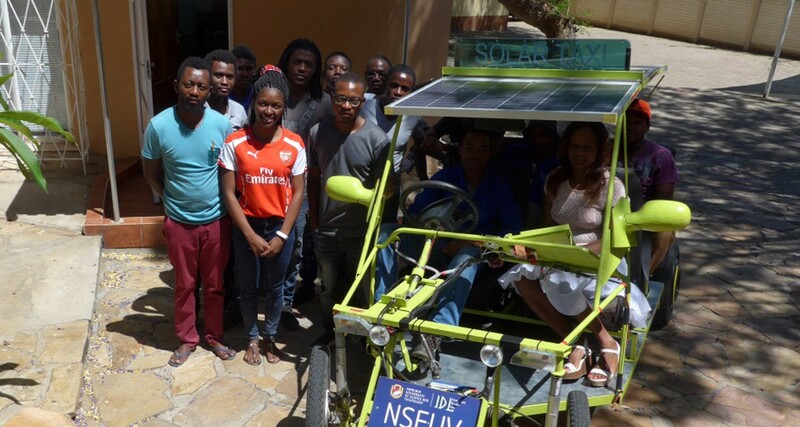 Their Namibia Solar Electric Utility Vehicle I (NSEUV 1) features a green metal chassis, as well as a creative assembly of disregarded cars' seats, wheels and components. Three mono-crystalline photo-voltaic panels mounted on the roof, collect solar energy, stored in lithium-ion swap batteries. The team is currently working on a second prototype, which – thanks to an aluminum chassis – is exceptionally lightweight at 280 kilograms, but can nonetheless transport loads of up to 320 kilograms. The plan is to adopt four flexible photo-voltaic panels, increase four-fold the number of batteries and install a software integrated sensor system to enhance the driving safety. According to UN statistic's projection, 60 percent of Africa’s population will live in cities by 2050. Fossil fuel propelled taxis account for about 50 percent of public transport in Africa, which is one of the reasons why the NUST team is developing a green alternative. The solar-powered electric vehicle offers several key benefits compared to a combustion engine: it uses 85 percent of the solar energy it collects and does not generate any harmful emissions during use. Lumaga, however, is not only interested in the production of the solar-powered taxi: with this applied research project, the 73-year-old aims to establish a nimble, creative working environ­ment and encourage the students to think and behave in an entrepre­neurial manner. The second prototype will be completed in the next few months and road-tested on the streets of Windhoek. Over the next two years, the team plans to develop the third prototype improving further the vehicle. The solar-powered taxi will feature software-based driver's assist technology. To meet the different needs of Namibians, Lumaga has adopted a modular design approach. There will be an essential version of the solar-powered vehicle that can be scaled up into a van, a bus – or scaled down into a motor-bike by combining appropriate sub-modules. The team aims to secure partnerships with local companies to ensure sustainable production and boost a value-added transport industry. Prices for the basic version of the Namibian-made solar-powered vehicle are expected to start at the equivalent of 5,000 euros. With her project, The Namib Desert Environ­mental Education Trust (NaDEET), Viktoria Keding has made it her mission to show the people of Namibia how they can protect their environ­ment and explain to them how they can use fewer resources whilst still respecting their culture. With her German roots, homeland of America and a love of Namibia that goes back 20 years, Viktoria Keding is at home in many different parts of the world. Having studied environ­mental protection in Brunswick, Maine, she went to Namibia as a volunteer environ­mental educator at the age of 22. She met her husband, Andreas Keding, at the AfriCat Foundation and stayed in southern Africa. 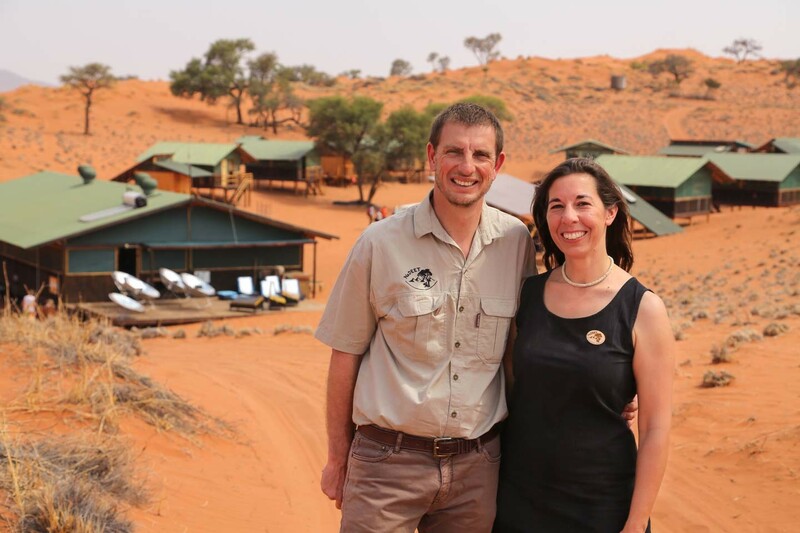 In 2003, the couple set up the NaDEET Centre, which is located in the heart of the NamibRand Nature Reserve. With her organisation, Viktoria Keding campaigns for climate and environ­mental protection in the country. At NaDEET, children and young people learn how to use energy and water sparingly, sort waste and protect biodiversity. 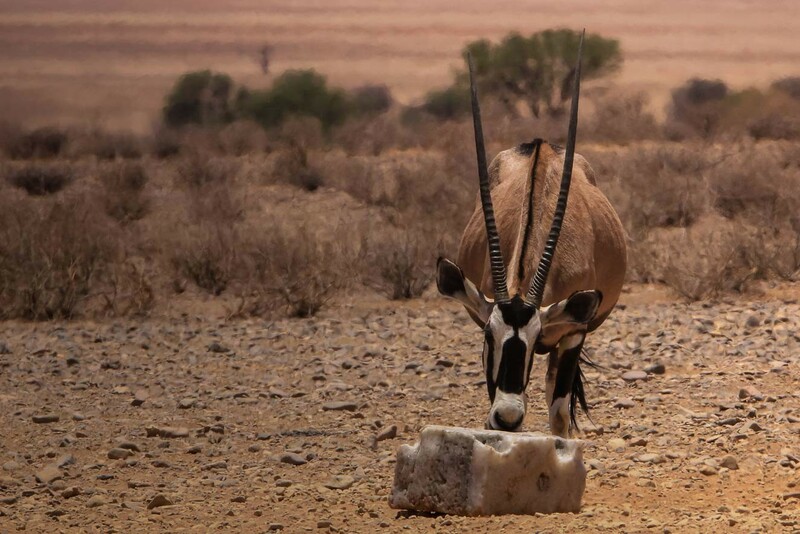 For a whole week, they live in their own accommo­dation units like a family in groups of eight – in the middle of the Namib Desert. At NaDEET, the focus is on hands-on learning: during their time at the camp, partici­pants measure their electricity and water use on a daily basis and learn how to recycle their waste. They cook and bake in a way that saves energy and resources, for example by using solar power rather than firewood. This unique training camp is often visited by school groups. Whilst the camp costs the equivalent of 17 euros a week, the general rule is that everyone gives what they can, making a stay affordable for school groups whose pupils come from more disad­vantaged families. But teachers, as well as local community leaders, also visit the Centre to learn and then share their know­ledge within schools and communities. Despite increasing deforestation, most Namibians still cook over an open fire, with many people in rural areas unable to afford gas or electric ovens. For all Namibian cultural groups fire is an important part of their cultural tradition “that you can’t just ban,” says Viktoria Keding. Whilst cooking with solar power is an alter­native, it has to be accepted and learnt in a practical context. NaDEET is committed to showing the people of Namibia how they can respect their traditions whilst still using the country’s few precious resources sparingly for daily needs. Some 13,000 Namibians have visited more than 400 educational programmes at the NaDEET Centre since it was established 15 years ago. The organisation’s environ­mental training has raised participants’ awareness of ecological issues. “They use water and electricity much more carefully when they get back home,” explains Viktoria Keding. Interest in the edu­cational camps has increased . “Since 2011 we have been fully booked every year with over 30 groups per annum”, Viktoria Keding says. That’s why she wants to expand the programme: with a visitor centre in Swakop­mund and a second environ­mental centre in another nature reserve in Namibia. Another of the environ­mental campaigner’s aims is to build up a network with other organi­sations, including govern­ment agencies.